Hard Not To Love put her second start away with a strong move in the turn. Hard Not To Love, who had already garnered the TDN’s “Rising Star” designation after a victorious debut, improved to 2-for-2 on Saturday at Santa Anita under confident handling from jockey Tiago Pereira. 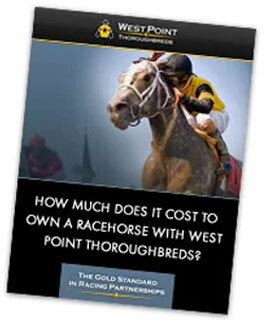 West Point Thoroughbreds campaigns the three-year-old filly with Mercedes Stables, Scott Dilworth, David Ingordo, Dottie Ingordo and Steve Moody. Going 6 1/2 furlongs as the 6-to-5 favorite in a field of six, Hard Not To Love tracked in the clear, about a length behind three others who slugged it out through a swift opening furlong in 21 4/5 and a half mile in :45. Hard Not To Love moved up to challenge going into the turn and took command heading into the stretch, opening up a three-length advantage under a hand ride from Pereira, who kept her mind on business in the lane as she held on to prevail by a half-length. The three-year-old daughter of Hard Spun provided a second winner on the day for West Point, which also scored in an entry-level allowance at Laurel Park with the sophomore colt Still Dreaming. 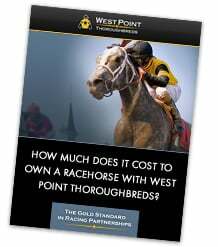 West Point notched its second double of the week, as both Chipolata (at Aqueduct) and Saints’ Girl (Keeneland) scored for the stable on Thursday. West Point and partners bought Hard Not To Love as a yearling at the Keeneland September sale in 2017, just prior to the emergence of her half sister Wonder Gadot, who finished second in last year’s Grade 1 Kentucky Oaks and went on to upstage males by winning two legs of the Canadian Triple Crown. Hard Not To Love is missing her left eye, which played a part in her not debuting until mid-February. With her vision as it is, trainer John Shirreffs gave her plenty of time to become comfortable in and around the starting gate. 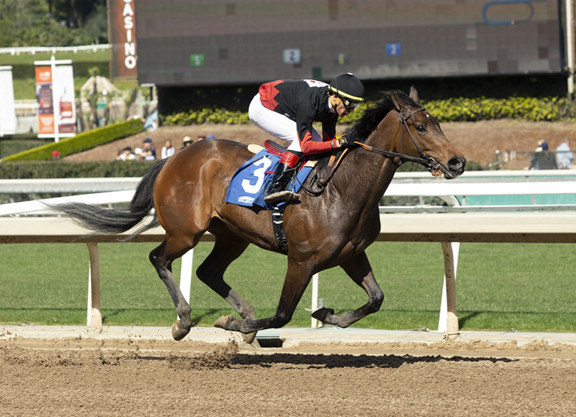 She started off impressively with a 3-length win over 6 furlongs at Santa Anita on February 16. Shirreffs noted after Saturday’s win that she has come a long way since her early days in his barn. Hard Not To Love will point for the Angel Flight Stakes going 7 furlongs at Santa Anita on May 4.